This morning my Spanish friend and myself went to dos ojos cenote (an under ground cave aquifer, named two eyes). We hopped on a colectivo (local taxi bus) which took us to the entrance. From here we paid $200 pesos (£10) to get in. 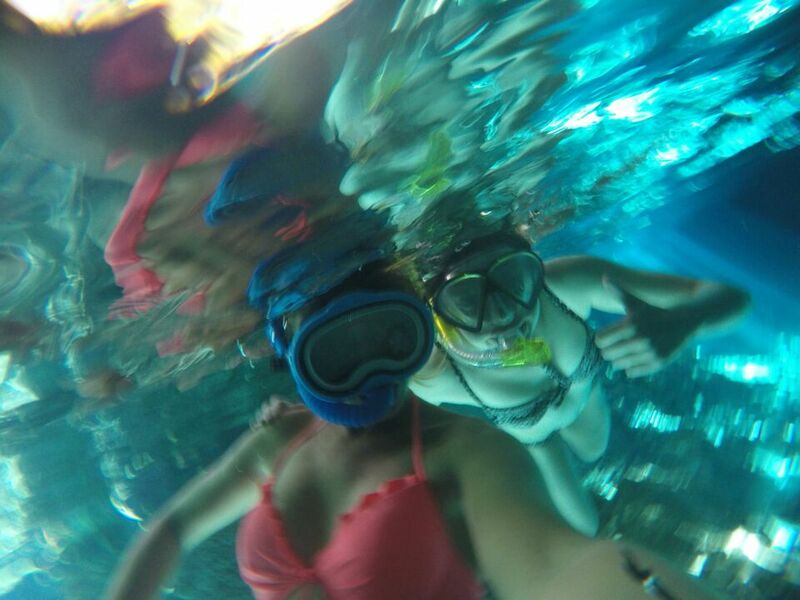 We walked about twenty minutes from the ticket office to the cenote. On the humid walk I learnt a few new Spanish phrases. When we arrived we were so hot and bothered completely ready to jump in the cold, clear, fresh water. 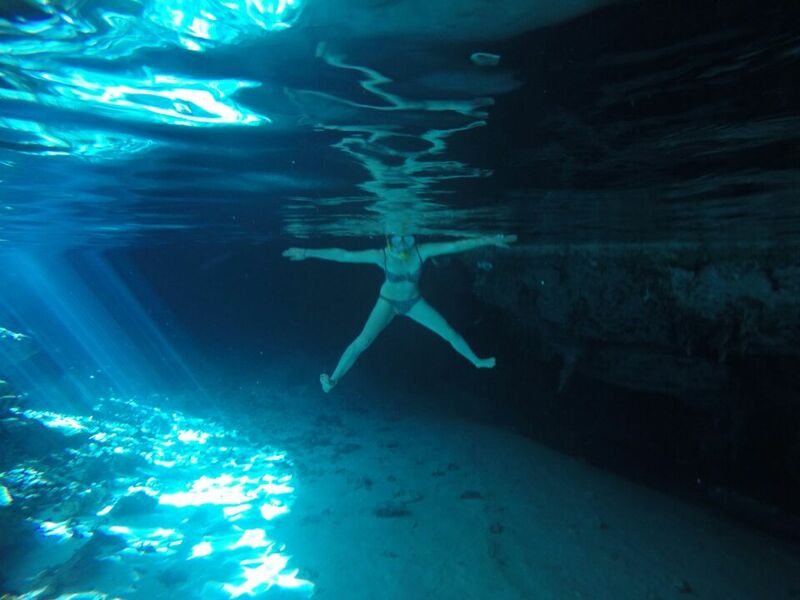 The reason for the aquifers name (two eyes) is because there are two cenotes you can explore by diving or snorkeling. The first one was magnificent. The crystal clear water tinged with blue was tucked beneath spectacular rock formations. I leapt in allowing the sweat wash off and my sticky body to cool down. Grabbing my snorkel gear I looked around this cave. Little fish swam around me, ducking into crevasses in the rocks bellow. I could see diver’s lights flicker way down exploring the nooks and crannies this cave system offered. Swimming around viewing the dramatic rocks was great. Protrusions stuck out from the bottom. I overheard a guide say that the formations were 11,000 – 13,000 years old. It was phenomenal. (travelers tip: no need to pay for a tour as you can do it yourself and hear what the guides say anyway by sneakily following them). The second cenote was just as incredible as the first. We were able to swim around in a circle through the gaps in the rocks while watching fish. My friend had a go pro so we took some selfies of course too. After such a refreshing dip I wanted to go to Akamal beach to go to the famous turtle watching spot. So I jumped on another colectivo and headed off. On arriving at the beach I was bombarded by tour guides trying to sell me expensive tours. I politely declined and carried on my way. I reached the beach which was packed not as quiet as the stunning tulum beach. Nonetheless, I was determined to have a quick snorkel to spot something. The only I issue being on my own was I had no one to watch my bag. Lockers cost $100 pesos (£5) for two hours – total tourist trap rip off. I could have bought 40 tacos with that in chipas (not that I can deal with any more tacos) but still I didn’t want the tour people to win. Writing this I am realising that £5 is not a lot but as a backpacker that could get me an extra night in a hostel somewhere. Hot, flustered and not wanting to leave my bag alone on a busy beach I spoke to a group of American’s who were most friendly. They were on typical American vacation in cancun and visiting for the day with a tour guide. We spoke about my time in Montana, USA and their holiday and then they looked after my bag while I went snorkelling – score. I had a dip in the ocean but struggled to see anything through the murkey sea water. As I was about to give up I saw a rather big fish – it was pretty cool. While I didn’t see any turtles I was pleased that I saw something and made some new friends in the process. It was a pretty full day, lot of snorkeling, swimming and some solo adventuring too.